Will Life Expectancy be 90 Years By The Time I Retire? When my grandpa was born the average life expectancy was about 50. But he lived into his 90's and when he passed the average person lived to be over 70. One might think then that if someone born in the 1990's when average lives are over 70 years then they might end up living to a point when the average life expectancy is in the 90's. Follow me? But is this really the case? Can we expect life expectancy to shoot up another 10 or 20 years in our lifetimes? 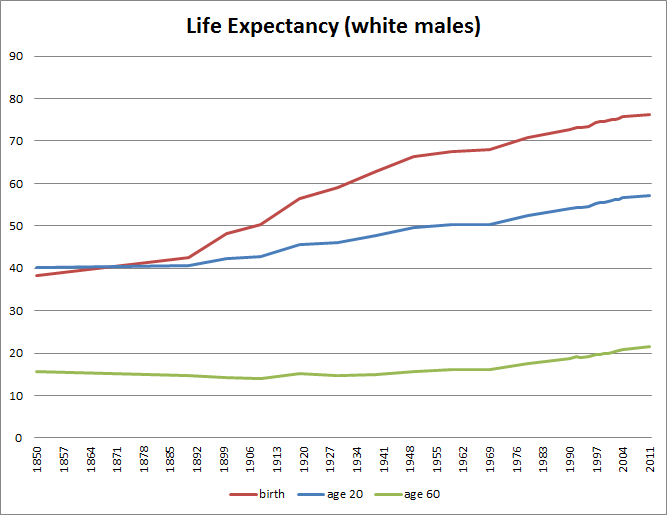 Lets take a look how life expectancy has changed over time. I'm going to look at just white males to simplify it but generally women and minorities would see roughly similar patters with bit different numbers. The source for my information is the Infoplease website and they seem to be just republishing government data. Now I'm showing the different age groups to point out how they differ. Life expectancy at birth (red) went up a lot more but a lot of that is reflecting how much fewer infants and children die from diseases now compared to the early 20th century. Its not as if the averages shot up because everyone used to die in their 50's but now live to 70, in reality for the most part the averages went up because many more people lived into adult years. 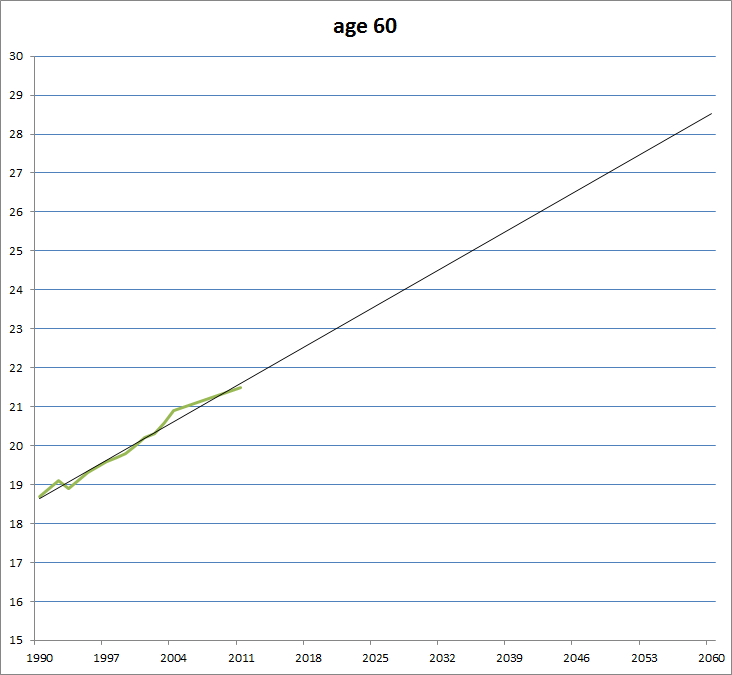 For the people who make it to age 60 (green) the average life span has not shot up much. Also, most of the gains in life expectancy were from 1900 to 1950. In those 5 decades the average life span went up over 18 years. However in the next 6 decades it has slowed down some and only grew about 10 years. In the most recent 2 decades its gone up less than 4 years total. How does the current trend project over the next few decades? I plotted the most recent figures from 1990 onward and then had Excel run trend lines out to 2060. 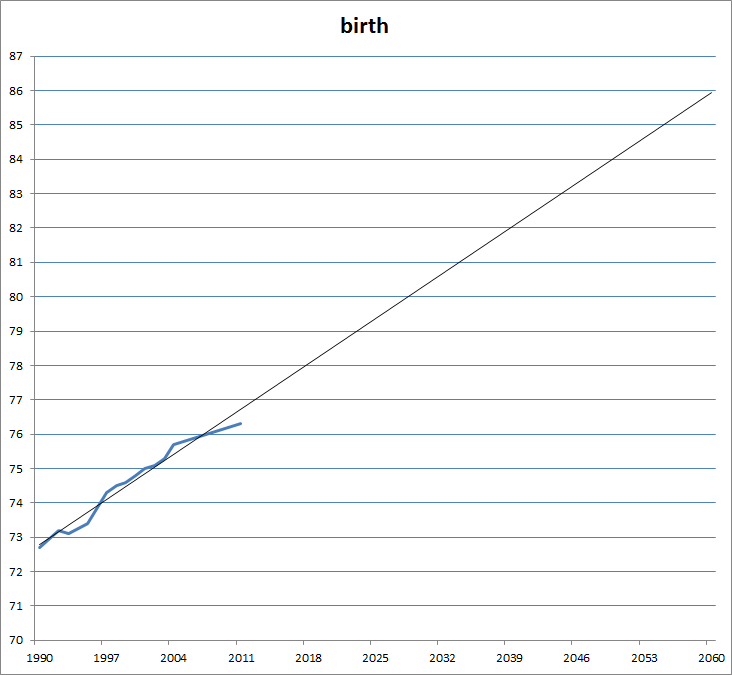 Roughly speaking it looks like at the current rate that life expectancy in about 50 years may increase about 10 years from birth, around 9 years more for age 20 and about 7 years for age 60.